Day 1 (Friday) Arrive at Bangkok Suvarnabhumi airport (airport code BKK) and say Sawasdee to Thailand. After clearing customs and immigration, you’ll be met by our local team and taken straight to your accommodation in the heart of Bangkok’s backpacker district, a journey of around 40 minutes, depending on traffic. Arrive any time between 6am and 10pm and we’ll be there to meet you at the airport with a warm welcome. Day 2 (Saturday) After a good night’s sleep (and/or a late night enjoying the Khao San scene), you’ll meet your coordinator and any other members of your group at orientation (it is highly likely you met already yesterday… At orientation you will learn more about Thailand, it’s history, culture and modern day life; as well as what to expect from your programme. Later, we take you on a fun city tour of Bangkok – we’ll explore the old city and it’s magnificent temples, and we’ll head out by boat on the Chao Praya, Bangkok’s main river which serves as a major transport route to get around this city, avoiding the infamous traffic jams. On return, we’ll enjoy an evening out on Khao San Road. ​Day 3 (Sunday) This morning we head to Surin, usually by train (sometimes bus), a journey of up to 7 hours through the Thai countryside. Thailand’s trains are slow but full of character making the journey an experience in itself! On arrival in Surin, we’ll check in to our city accommodation with time to explore this great regional city, where tourists remain a novelty and are often met with a warm welcome. Days 4 to 7 (Monday to Friday) On Monday morning we’re off to the elephant village, in the countryside outside Surin city. Here at the village you’ll live alongside the local people and of course the elephants. Immerse yourself into traditional village life and get up close and personal with one of Thailand’s most iconic creatures. From Monday to Thursday you will stay in homestay accommodation here in the village and support the mahouts caring for the elephants. Afternoons are about relaxing at the house or joining in fun activities organised by the team. Your village hosts are excellent cooks and all meals while at the village are included. On Thursday afternoon, we return to Surin city, to the same accommodation as when you arrived. Friday is a free day, so kick back and enjoy the charm and relaxed pace of Surin, where tourists remain a novelty and are often met with a warm welcome. Surin is a fairly laidback town with a small but interesting night market during the week. At weekends, the pace picks up with a livelier night-life to explore – there are dozens of great places to eat, plenty of bars and even a few clubs to check out. Our Surin the team will recommend the best places to go and you’ll find the cost of living pretty cheap by our standards with a meal as little as $3-4! Day 9 and 10 (Saturday / Sunday) Saturday morning, our team will drop you at the train station with all you need for the journey to Bangkok - tickets, hotel reservation and taxi fare with instructions in Thai for the driver. The Bangkok hotel will be familiar, as you stayed here the first two nights so you’ll already know the area. Sunday morning you’ll travel with your coordinator to Sangkhlaburi. It is a beautiful coach journey with an equally beautiful destination awaiting you at the end. Our local team will greet you upon arrival and show you to your accommodation. After settling in, we’ll show you around town and tell you all you need to know about the next few days. There will be a few hours to relax or get out and explore the town further. Later you’ll have chance to get to know your coordinator and team over dinner and drinks. Days 11 to 15 (Monday to Friday) The building project typically ventures out to rural villages where people need the most help. The program supports the local community through the donation of materials and volunteer labour for construction projects. These projects are varied, from the provision of community water tanks to building a new children’s centre or renovating a school, from the construction of a 6km water pipe for a rural village to building toilet blocks at a care home for the elderly. Whatever the specifics of your project you’re not expected to be an expert and you’ll not be exposed to anything risky – our coordinator is there to guide and advise you, and work gloves and water are always provided. Each day follows a similar pattern – after breakfast we’ll head to the project to start around 8am. Driving out to the rural communities is an experience in itself, as the roads wind through the beautiful hill scenery of the Myanmar border area. We’ll have an early lunch at a local restaurant, where the offerings are fresh, tasty, filling and very cheap ! Back to work for a few hours before we head back to town mid afternoon. Days 16 and 17 (Saturday to Sunday) The Saturday morning, our team will drop you at the bus station with all you need for the journey to Bangkok - tickets, hotel reservation and taxi fare with instructions in Thai for the driver. You’ll spend the night in Bangkok and all day Sunday, before taking the overnight bus south which leaves at 9pm (Sunday). Long distance overnight bus travel in Thailand is very normal, very safe and a fun part of any travel experience here, and our team will have provided everything you need for a seamless journey with problem-free connection to the Koh Phangan ferry. You’ll be met on arrival next morning and taken to your home for the next 10 nights in paradise ! Days 18 to 27 (Monday to (the following) Wednesday) Your days and nights here in your island paradise are yours to play with as you wish. Koh Phangan has some of the most incredible beaches in Thailand, with white sand, clear water and blue skies at every turn so find a shady spot in the sand and relax. Take a hike up to one of the many awesome viewpoints on the island for a breathtaking panorama. There are loads of temples, waterfalls and jungle to explore on the island. In and on the water, try your hand at kiteboarding or waterskiing or snorkel/dive to check out the underwater world. Whatever your pace, come sunset you’ll want to grab a cocktail or coconut and enjoy the good vibes. Koh Phangan is world famous for its parties – full moon, half moon, black moon…you name it, there will be a party of some sort most nights. For a more chilled evening, grab dinner in a beach shack restaurant and chat with backpackers from across the globe. Day 28 and 29 (Thursday / Friday) Time to wave goodbye to Koh Phangan as you make an early start on the ferry to the mainland, heading back to Bangkok on the daytime bus, arriving in the city late evening. One last night in Bangkok with a final chance to shop or party on Khao San Road before you depart any time on Friday. The Elephant Village Experience provides a responsible and sustainable alternative. It provides an experience that financially supports the whole community whilst allowing visitors to participate in village life. 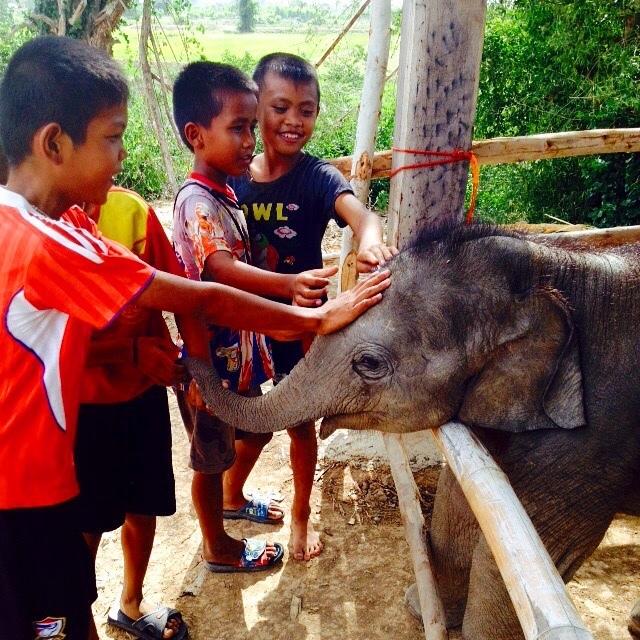 This fosters an opportunity for travellers to learn about rural Thai culture as well as begin to understand the diverse challenges that face elephant communities in Thailand. Along with your group, you will spend lots of time up close to these magnificent animals. You will also come to understand the meaning of ‘sanook’. If it's not ‘sanook’, it's not worthwhile! – boy do the villages know how to have a great time! Please note that we do not condone the riding of elephants by visitors. Riding of the elephants by customers is not allowed. The bond between the mahout and elephant is very special and culturally complex thus should be respected. Accommodation In Bangkok, you’ll stay at a local guest house In Bangkok, you’ll stay at a local guest house on Khao San Road, the backpacker heartland of Bangkok. Rooms are basic but comfortable, allocated on a shared basis and with air-con, hot shower and en-suite bathrooms. Wifi is available for a small fee. In Surin your home will be one of our team houses which are rented from the local community in a great location. Rooms are fan-cooled and hostel-style and bathrooms are shared. Free access to wifi is provided, though don’t expect reliability or lightning speeds here in the provinces. At the elephant village , accommodation is a local family homestay, basic but clean and comfortable. You will live ‘Thai style’ sleeping up to five a room on floor mattresses. Fan-cooled rooms have mosquito mesh windows to keep the bugs out, and shared bathrooms have cool showers. There is a shared kitchen where our team will help you prepare some delicious meals. No wifi here. In Sangkhlaburi we stay in a city centre hotel, in twin or triple rooms with air-con, en suite and hot water. There is free wi-fi. In Koh Phangan, you’ll stay in a twin/triple/quad-share room at a beachfront hotel with pool in a relaxing area, easily accessible to busy Haadrin.